Jackie Dewain Collins was born January 4, 1936, to Jack and Velma Collins (Thompson) in Hobart, Oklahoma. On January 13, 2019, at 5:35 P.M. he answered his heavenly father’s call to come home. Jackie was raised in Lone Wolf, Oklahoma and helped his father on the family farm. At an early age, he gave his life to God and remained a faithful servant throughout his life. Even until his passing, he continually expressed his faith and love for God. Jackie met the love of his life, Miss Lorene Collins (Mixon) at an Assembly of God Church singing. They married on June 6, 1955 and after their wedding they stayed for the evening church service. Jackie and Lorene made their first home in Mangum, Oklahoma and he worked for Puckett’s Grocery Store. 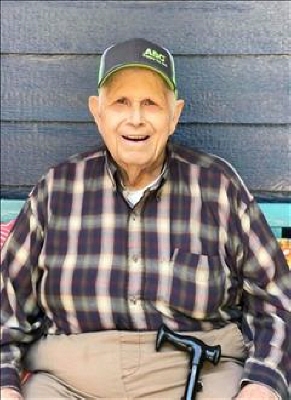 He took his family to Pampa, Texas and he worked for Furr’s Supermarket. Jackie then returned to Mangum in 1965 and worked for Republic Gypsum. Later, he began working at Altus Air Force Base in the Commissary and later worked for the 443rd Supply Squadron and retired after 30 years of service in 1995. Jackie was known for his hard work and honestly. Along with his Civil Service career, he found time to work additional jobs to raise his family. He owned his janitorial business, worked at Altus Public Schools, and mowed yards for others. Jackie loved and gave his all for his family. He not only cared for his own children, but he and Lorene opened their homes to foster children as well. He was not a sportsman because he focused his time and energy into caring for his family and loving God. His best moments were spent loving Lorene, his children, grandchildren, great grandchildren, and great-great grandchildren and his eyes would light up when he saw them. He will be greatly missed, and the void will never be filled by his loss. He is preceded in death by his parents, wife, Lorene, and one daughter, Sharon. Jackie is survived by his son Darrell Collins, and wife Patty, Daughters; Shelia Robison and Teresa Solis and husband, Richard, two sisters; Margret Winters, Mary Cryer and husband Wendal. Two brothers; Herman Collins and wife Ann, and Allen Collins and wife Judy, eight grandchildren, 23 great-grandchildren and 2 great-great-grandchildren. Funeral services will be held at 2:00 P.M. Wednesday, January 16, 2019, at The Mangum Church of God, with Interment to follow at Lone Wolf Cemetery, in Lone Wolf, Oklahoma. The family will receive friends from 6:00-8:00 P.M. Tuesday, January 15, 2019, at Greer Funeral home in Mangum, Oklahoma. To send flowers or a remembrance gift to the family of Jackie D. Collins, please visit our Tribute Store. "Email Address" would like to share the life celebration of Jackie D. Collins. Click on the "link" to go to share a favorite memory or leave a condolence message for the family.